World Population Day is celebrated on 11 July every year to raise public awareness about certain important population and development issues. This year’s World Population Day was dedicated to family planning, which is one of the fundamental human rights. About 80 persons, including professionals, women and men of reproductive age, young people, persons with disabilities, business entities, have discussed this topic in a public event organized in Chisinau. ‘All children should be wanted and born in families that are prepared. That is why family planning is so important and represents a universal right in modern society. We have set the goal to improve the access and the quality of planning services for all individuals, regardless of their age, ethnicity, residence, social or health status, as well as to inform population. To this end, we have approved a new National Program on Sexual and Reproductive Health and Rights for 2018-2022 containing a range of actions to achieve these goals’, the Minister of Health, Labour and Social Protection Svetlana Cebotari stated. ‘Family planning was proclaimed as a human right 50 years ago. It means that all couples and individuals have the right to decide freely and responsibly the number, spacing and timing of their children, and whether they want to have children or not. Thus, to be able to exercise this right, each person should have the access to information, guidance and high-quality family planning services, including to modern means of contraception’, said Rita Columbia, UNFPA Representative in Moldova. 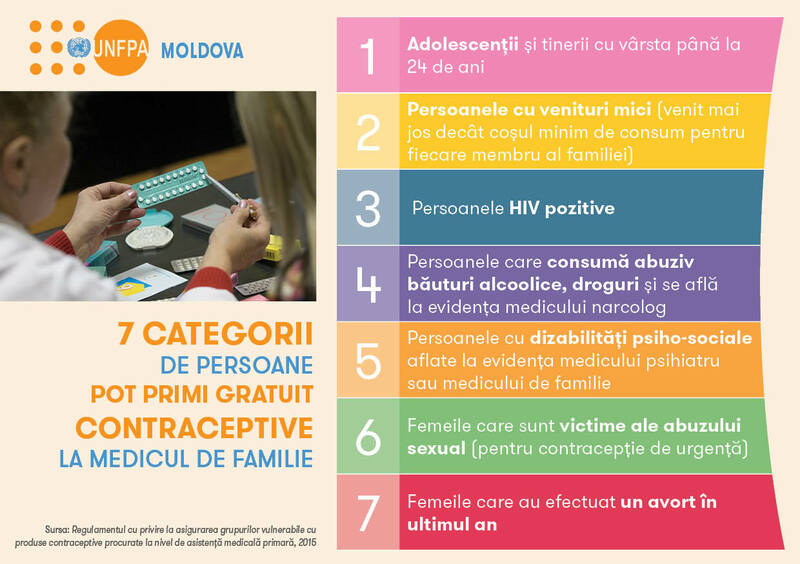 Currently in Moldova, 17% of women of reproductive age (15-49 years old) have unmet need for family planning even though they do not plan to get pregnant. Only 1/3 of women use modern contraceptives, while 14% resort to traditional means of contraception. According to health practitioners, besides modern and traditional contraceptives some persons use the so-called ‘folk means’. The experts warn that such practices are inefficient and harmful for people’s reproductive health. Note that 7 categories of persons are entitled to receive free contraceptives from the family doctor: Teenagers and young people under the age of 24 years; Families with low incomes (an income lower than the minimum consumer basket per each family member); HIV positive persons; Persons who abusively consume alcohol, drugs and are registered with the addictionologist; People with psycho-social disabilities, registered with the psychiatrist and family doctor; Women-victims of sexual abuse (for emergency contraception); Women who aborted during the last year. The event was organised by UNFPA Moldova in partnership with the Ministry of Health, Labour and Social Protection.